Well, as the last post of 2011 I decided to grab a cigar out of the Cuban humidor. 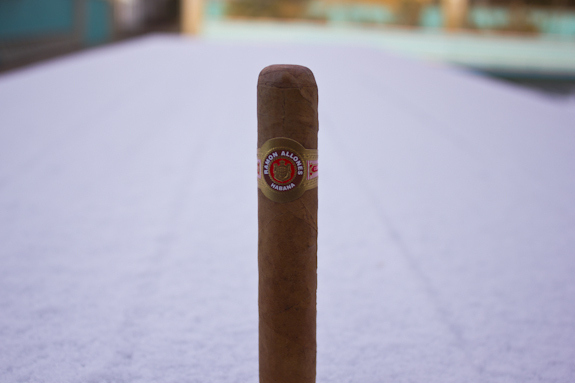 It was a little chilly outside so I opted for something short and found a Ramon Allones Specially Selected. 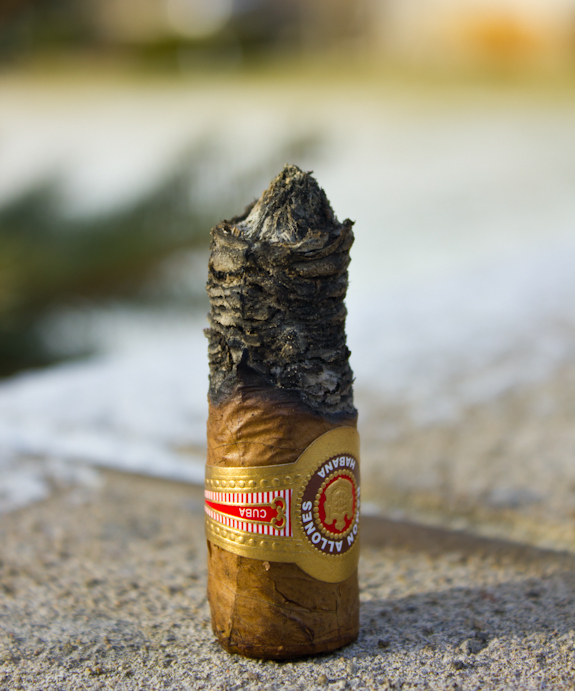 This is the Robusto vitola offered by this Cuban cigar manufacturer. And Happy New Year to all our wonderful readers! 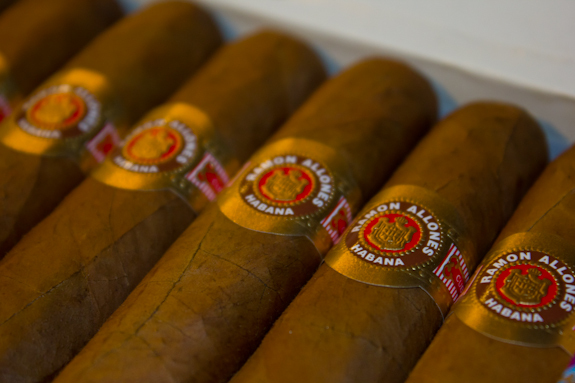 The Ramon Allones brand isn’t too popular, but the Specially Selected seems to have garnered a fairly faithful offering. 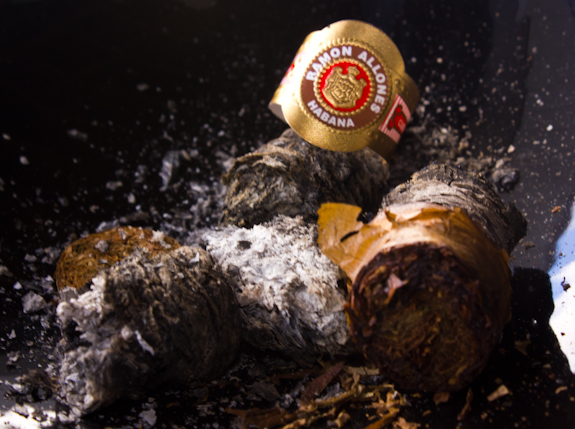 The brand actually began way back in 1837 by it’s two founders, Ramón and Antonio Allones. 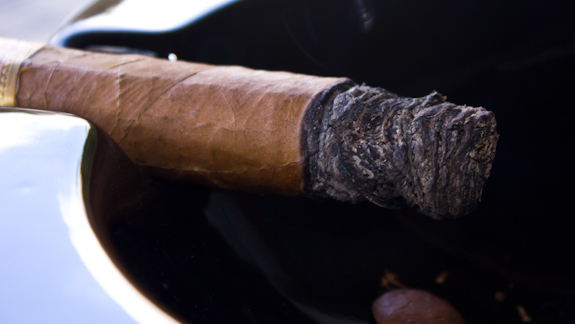 After a variety of ownership changes the company was eventually purchased by the Cifuentes company who also owns the Partagas brand. 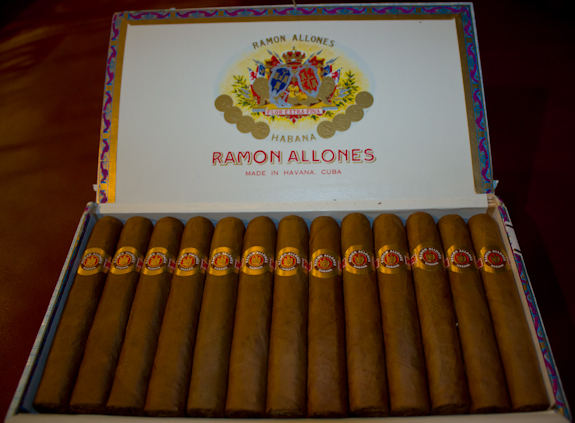 Manufacturing for all Ramon Allones cigars also comes from the same Partagas factory in Cuba. The brand used to have a much larger vitola selection but since 2001, when Altadis bought a heft portion of the company, a lot of the sizes have been discontinued. 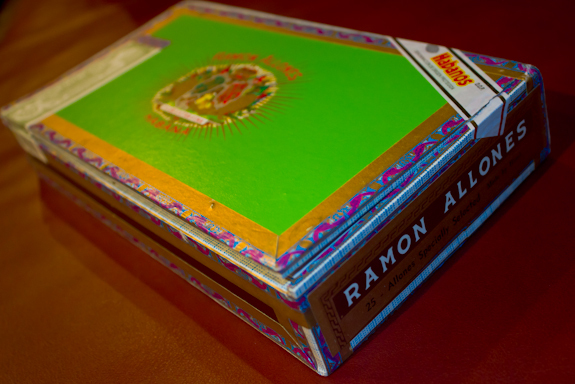 The Ramon Allones brand is also heralded as one of the first Cuban cigar manufacturers to use full colored emblems on their boxes and possibly one of the first to produce the infamous 8-9-8 style of packaging. 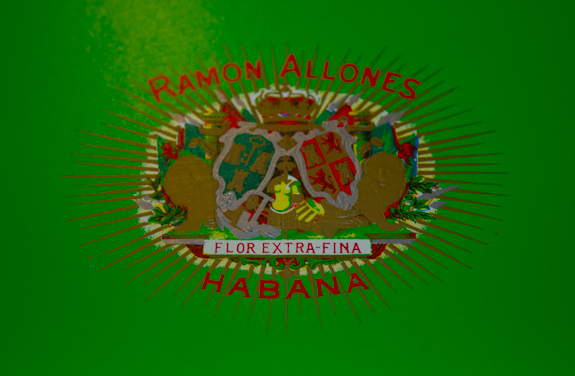 As of current research, Ramon Allones is currently selling cigars in 4 vitolas along with an occasional Regional Release or Special Edition to round out the line. The particular cigar I will be smoking today comes from a box with a fairly recent date of May 2011. It will be interesting so see how this cigar performs early in the aging process since the recomended age time for this cigar is roughly 3 years. •	Just past the halfway mark I noticed a decent tar buildup on the cap, lucky for me I caught it before I touched it with my tongue, so a quick clip and I was good to go. 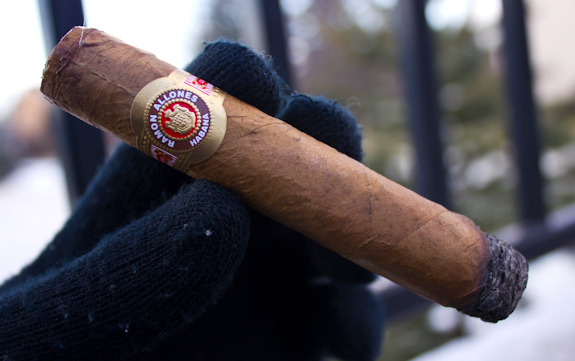 The Ramon Allones Specially Selected turned out to be a nice mild to medium classic Cuban cigar. I don’t think it does anything new or special but it’s one of the more affordable Cubans you can find and they seem to be constructed consistently well from the ones I’ve had a chance to enjoy. The cedar and earthy flavors are enjoyable and the hint of licorice and spice brought an interesting layer to the mix that kept my attention. I did get some tar on some of the ones I smoked but it wasn’t anything terrible, one quick clip kept it at bay. I can see myself possibly getting some more of these in the future but I’d be curious to see how they age first, maybe I’ll revisit them in a year or so and see how things have changed. Good to know they are tasty and not overpowering while fairly fresh, so grab a few to try if you can. Another Innis & Gunn you say? Of course! These guys make some awesome beers and I keep finding more new ones to try. Today’s choice is called the “Spiced Rum Finish” and came as part of the Winter Sampler pack. I’ve never had this particular brew before so I was curious to see how it turned out given my awesome track record with this brewery. Well, what an interesting beer this turned out to be. At it’s core, you can tell the classic Original Oak Aged style is there but it has an extra punch. Each sip gives just a tiny little spicy kick of raw cinnamon or cloves, maybe even a touch of pepper. Very unique that’s for sure and damn tasty if I say so myself. Very disappointed to see that it’s only available in the holiday pack cause I would easily vouch for a case if it were available to me. 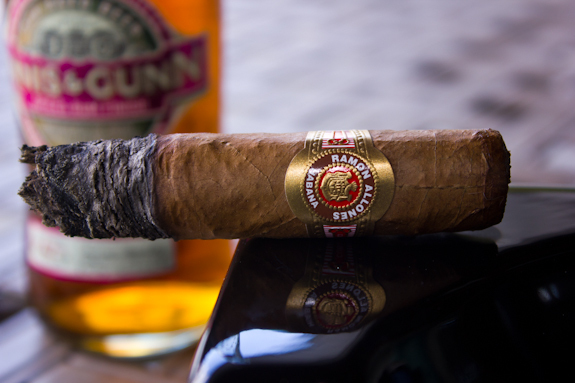 This paired perfectly with the mild to medium bodied Ramon Allones Specially Selected and would pair very well with other medium bodied cigars. 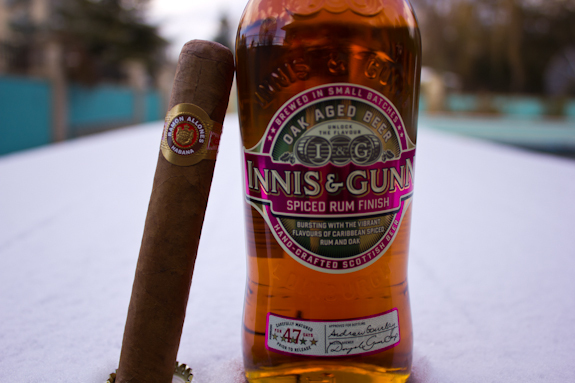 Other suggested pairings for this cigar would be coffee or other lighter amber brews, maybe even a Tripel. I’ve read positive reviews on this one, as you alluded to. Of course, it would be a PITA to get hold of any. Maybe the next trip to Vancouver, whenever that might be. lol jjo, I love my port but I gotta change it up now and then. And I love me some Innis & Gunn! I actually haven’t been to Vancouver but it is on my to do list. You go there a lot? I’ve been there several times, but now that I think of it, it’s been about 10 years. :p Great city! Dan as always nice review, your a bigger man then me if I have to smoke with gloves on forget it. My cigar smoking takes a little break during the winter months and I try to stoke up. But your up there in the Tundra so Gloves are pretty much like a second skin huh? haha Happy New Year bro. I wish I could say I reached into my Cuban Humidor….. Damn…. See there is an advantage to living up in the great white north, I smoked a RA Canada release and it was pretty damn good. I can only imagine what time would do for these. Sounds like a weiner! Have a great new year! I haven’t tried the RA, usually I buy Cubans by the box and the prices for those Regionals are pretty crazy, so I don’t get to try them much. I definitely plan to age some of these and try one every few months. Hopefully they will live up to what I hear about them. Time will tell! Hi Daniel, great review once again, I have gotten together a couple times over the holidays with Lee Douglas of the infamous Fat City Cigar lounge, but last night Dec 29th was the topper, let me tell you about it in many, many words…..I started out with a Rocky Patel Edge, paired with 2 shots of Dalwhinnie 15 year old scotch, a great pairing indeed, like starting the fireplace on a cold Christmas eve. Then Lee showed up and we had something a bit different, a Drew Estates Tabak Especial coffee infused Belicoso, I paired this with 2 shots of a bit sweeter scotch the unknown but wonderful Auchentoshan 12 year old. As you can imagine it was like eating Christmas pudding with Rum sauce. After that we indulged in a Joya De Nicaragua Cabinetta series paired with two shots of Glenmorangie Sherry Cask 12 year old scotch, Lee is now starting to look like Santa Claus and the world is a festive place indeed. But all things must end and Lee has to go home as it’s near Midnight and he is a bit over spirited, my son gives him a ride home so he doesn’t hurt a ditch along the way. Well I say to myself…time for a night cap !! and I dig out of the humi a La Herencia Cubana Fuerte double ligero bad boy, I pair this up with another double shot, this time a contender in the scotch world, the Ligero equalizer indeed a peaty S.O.B. the 16 year old Lagavulin, once this was done, so was I, but before I went to bed ( to my wife’s dismay ) I sang out loud and proud “Merry Christmas to all and to all a good night”.